New technologies have brought us to an era of lightning-quick communication and instant information that’s just a click away. But it’s also ushered us into a new age of science, particularly when it comes to understanding the broad-scale impacts that are affecting our larger biosphere. That new balance between science, technology and nature can manifest as using machine learning to more effectively help the conservation of endangered species, or using robots to monitor wildlife or track oil spills, to deploying drones as part of an unconventional wildlife vaccine delivery program. These new technologically bent solutions can also help us keep our natural environment cleaner, by first getting some hard, quantifiable data on things like the level of pollutants. 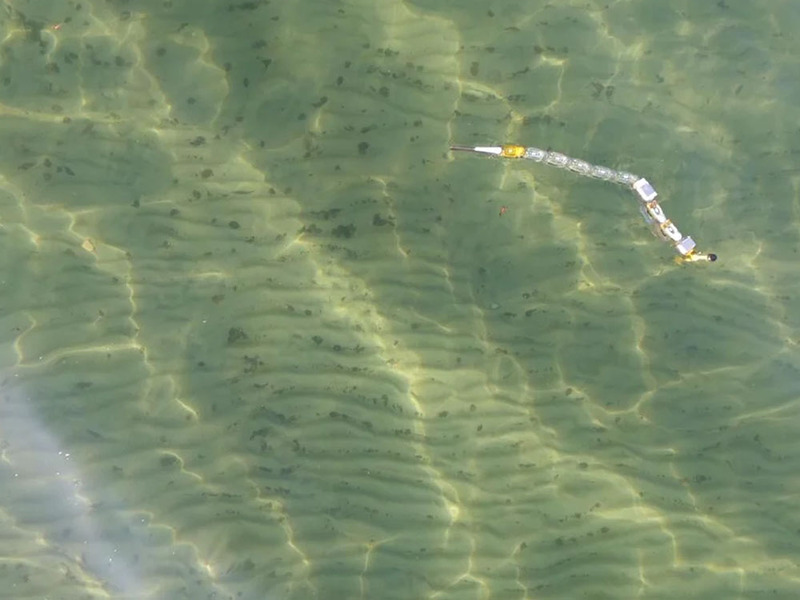 Inspired by the form and biomechanical function of eels and snakes, this intelligent robotic eel can swim through polluted waters, collecting useful data while zeroing in on the source of contamination. 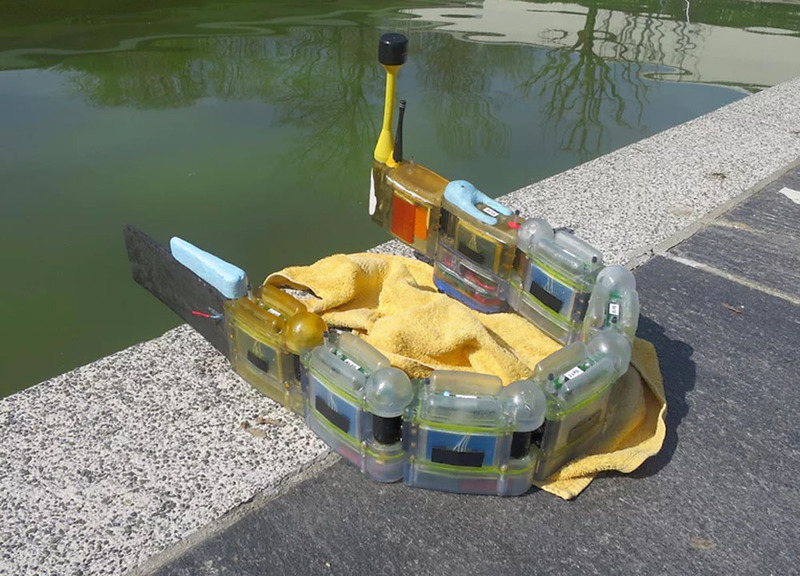 Developed by the École Polytechnique Fédérale de Lausanne (EPFL), the Envirobot is an aquatic machine that is outfitted with an array of sensors that allow it to detect various toxic substances as well as gauge variables like water temperature or conductivity. It gathers and sends all this data wirelessly to researchers on the ground, without dragging up sediments from the bottom or agitating local plant and wildlife. Another advantage is that this slithery robot can also be either operated remotely or instructed to follow a predetermined set of variables. “The Envirobot can follow a preprogrammed path, and has also the potential to make its own decisions and independently track down the source of pollution,” added Ijspeert. 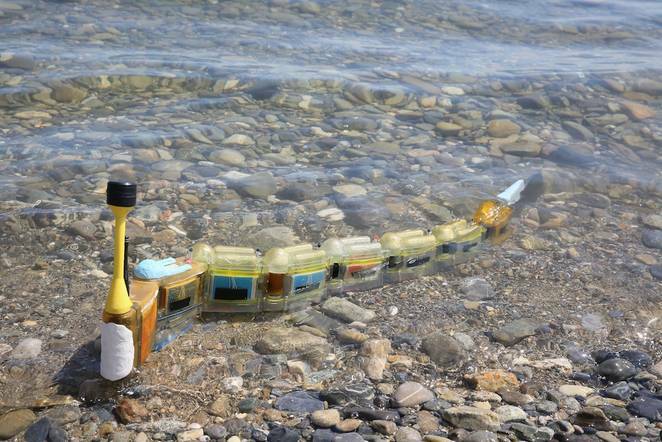 The eel-like robot’s modular design means that it can be easily disassembled, transported to remote areas, and quickly assembled with a custom-tailored configuration of sensors for testing waters in a new location. It can be made longer or shorter, depending on the task. To help it move, each of the bot’s modules is equipped with a small electric motor for altering its curvature. 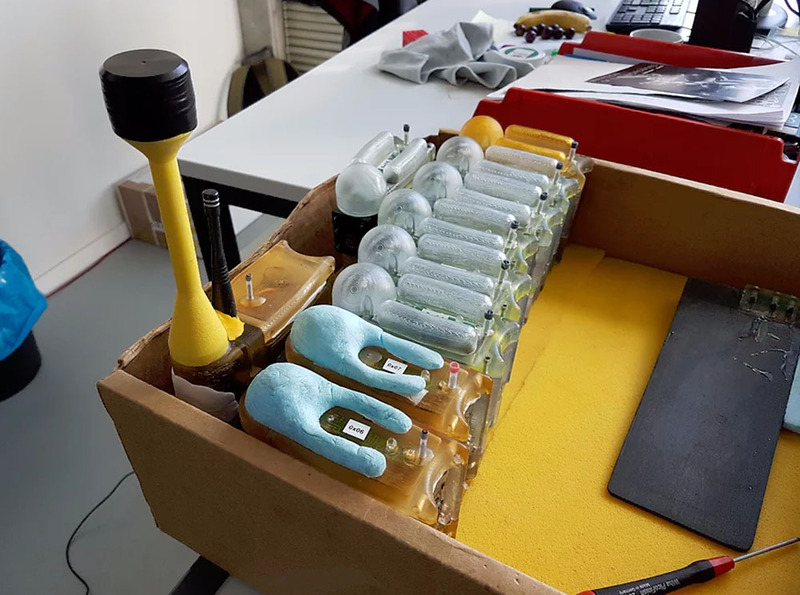 But one of the most intriguing features is the bot’s array of sensors, some of which are artificial in nature, measuring things like temperature and conductivity. These conventional components are combined with innovative, biologically based sensors, which can contain organisms like bacteria, tiny crustaceans or even fish cells. These biological sensors are designed as chamber-like containers which fill up with water as the bot glides about, prompting the organisms within them to react to certain toxins in the water, thus providing visible clues to toxicity levels in any body of water. Some of these microorganisms are what are called bioreporters, which have been genetically engineered to produce a measurable signal in response to the presence of specific chemical or physical changes in their environment. “For example, we developed bacteria that generate light when exposed to very low concentrations of mercury. We can detect those changes using luminometers and then transmit the data in the form of electrical signals,” explained microbiologist Jan Roelof van der Meer, who is the project’s coordinator and heads up Université de Lausanne‘s fundamental microbiology department. Another kind of sensor uses fish cells which are cultivated in clusters on electrodes. When these cells come in contact with toxins, they disengage with each other, noticeably disrupting the flow of electricity. So far, the researchers have tested Envirobot out in Lake Geneva, adding salt to a small area to simulate water pollution. 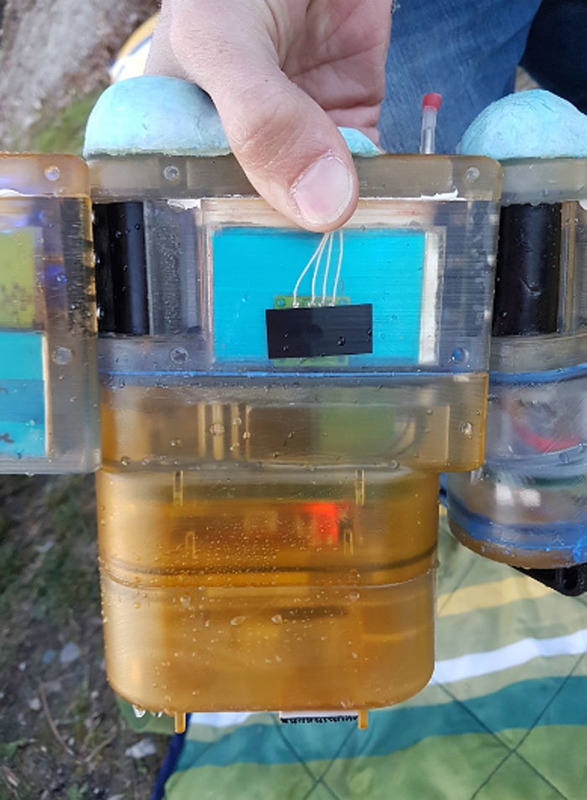 The swimming bot did well in these tests, maneuvering itself to the affected areas and collecting enough data to generate maps of water temperature and conductivity. While the team has yet to test the biological sensors out in the field, citing a desire not to contaminate water with test toxins, the sensors have nevertheless performed well in laboratory tests. So while there’s still some time before we’ll see such pollution-detecting robots out in the wild, tracking traces of unwanted contaminants in our waters, it gives us a glimpse into the future of how robots might interface with biological organisms to create a more effective tool. Read more over at École Polytechnique Fédérale de Lausanne (EPFL).